This activity is a great for the beginning of the school year. 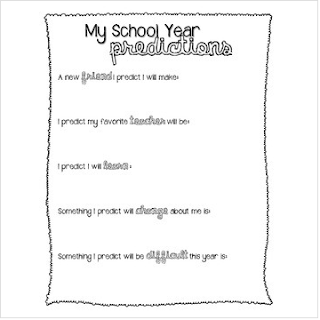 Use it as morning work or as an easy "get to know you" homework activity! Have the students write predictions for their school year! Consider expanding the activity by turning one of the questions into a full writing prompt, encouraging students to elaborate on their though process. This would be fun to revisit at the end of the school year as you're winding down and saying good byes! !